Please refer to our stock # mdl5 when inquiring. 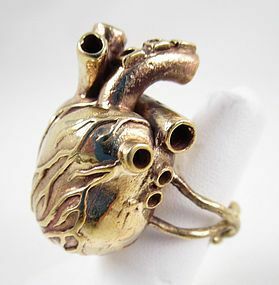 This unusual hand crafted ring will surely attract attention when worn. Highly detailed and cast from brass, it measures 1 1/2" x 1" wide x 3/4" thick. The realistic heart design has arteries, veins, and valves, and the split shank is approximately a size 6 1/2. It is split so it will adjust to most average ring sizes. It is in excellent condition.